This article was written by TutorMandarin, an online tutoring service that helps students to learn Mandarin, through its Chinese learning app and PC Software. There are three major Chinese Holidays in Chinese culture: Chinese New Year, Dragon Boat Festival, and Mid-Autumn Festival. Today, we’ll talk about Mid-Autumn Festival (中秋节, Zhōngqiū jié), including the four myths about it, and how they contributed to the current traditions of the holiday. Mid-Autumn Festival takes places every year on August 15th of Chinese Lunar Calendar. For 2017, it will fall on October 4th, 2017 of the National Calendar. Mid-Autumn Festival is a traditional Chinese festival held in appreciation of the moon and a way for families to reunite once a year. Since its inception, Chinese people use this day to watch the bright full moon (满月, Mǎnyuè) with their family. But how does the full moon and family reunion connect in Chinese culture? For that reason, Mid-Autumn Festival is also called “The Reunion Festival” (团圆节, Tuányuán jié). On August 15th in Chinese Lunar Calendar (the “middle” of Autumn), the moon enters its full moon phase. Moon appreciation (赏月, Shǎng yuè) is the most important activity. Family members all gather and have a meal, eat some mooncakes, and tell some Mid-Autumn Festival tales to the children. The myths of Mid-Autumn Festival are well-known in Chinese culture. As most tales, they’re fantastical stories that hold deeper symbolic and moral meanings. For instance, every Chinese child has heard that in the moon lives the beautiful Chang E, a cute Jade Rabbit, and the woodman Wu Gang. In the sequel of this article, we will intorduce the four main myths about Mid-Autumn Festival. Legend has it that there were ten suns in the sky, in the ancient time. The scorching suns made people suffer – the land was lifeless and people could barely survive. Hou Yi (后羿), who was known for his powerful strength and superb archery skills, felt sad for people’s suffering and decided to help them. He climbed to the top of a mountain and began shooting down the suns, eventually shooting down 9 out of the 10 suns. He left the last sun to keep the earth bright in the day and nurture the crops. Hou Yi soon became a beloved hero in people’s hearts. Afterwards, Hou Yi married to the beautiful Chang E (嫦娥, Cháng’é). Hou Yi also started to teach his apprentices archery skills. But did the couple live happily ever after? Not quite. This brings us to our second story. Chang E (or “Chang Er”, 嫦娥) is “The Goddess of the Moon” in Chinese culture. Hou Yi and Chang E loved each other very much. So why is she now on the moon alone? One day, Hou Yi came across the Heavenly Queen Mother (王母娘娘, Wángmǔniángniáng) on his way to visit his friend in Kunlun Mountain. In order to live with his wife forever, Hou Yi kindly asked the Heavenly Queen Mother for the elixir of immortality. The Heavenly Queen Mother was so moved by his love to Chang E that she gave him the medicine. However, it was only enough for one person. Hou Yi didn’t want to leave his wife by taking this immortality medicine alone, so he asked Chang E to keep it for him. However, the evil apprentice Peng Meng (蓬蒙) heard about the immortality medicine and planned to steal it from Chang E. When Hou Yi took his apprentices out hunting, Peng Meng claimed he was sick and stayed behind. While Chang E was alone in the house, Peng Meng broke into the house and threatened her to give him the medicine. Helpless and scared, Chang E swallowed the medicine in desperation. After she swallowed the medicine, Chang E felt her body become too light to stay on the floor. She rose out of the house up into the sky and finally landed on the moon. After Hou Yi came home and found out what happened, he was outraged and depressed. However, he couldn’t take revenge on the evil Peng Meng (who had already escaped) nor get his beloved wife back. 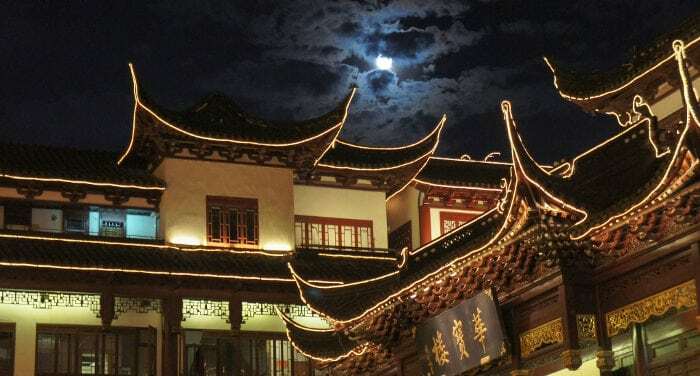 Chang E then settled down in Guanghan Palace (“The Moon Palace”, 广寒宫) in the moon, becoming the tragic immortal Goddess of Moon that was separated from her husband. Hou Yi could do nothing but prepare Chang E’s favorite food, stare at the bright full men, and think of her. As people learned that Chang E became a Goddess of Moon, they decided to follow Hou Yi to commemorate and pray for Chang E’s blessings. Wu Gang (吴刚) was a lazy man that was obsessed with becoming an immortal God. However, he was so quick to quit that he could never continue a task that lasted more than 3 days. Nevertheless, Wu Gang desperately wanted to be immortal, and sought out a Chinese God to help him achieve his goal. Wu Gang eventually found a gray-bearded, older God in the mountains and asked him to teach Wu Gang how to become an immortal God. “It’s not that easy to become immortal, you know. Are you sure you can stand the long and tough journey to become a God?” asked the God. “Yes, yes, of course I can, just teach me how!” replied Wu Gang. He complained and complained about how tiring the work was. But the old God gave him another chance. The God told Wu Gang to finish reading a book about life and philosophy. “You should first understand the philosophy of the universe, read it through,” said the God. “And I’ll become immortal afterwards?” Wu Gang asked expectantly. He quickly agreed. “Well, since you said that, let me take you to the moon and have a look around.” The God flew to the moon with Wu Gang. After they arrived on the moon, Wu Gang saw nothing but a bald land and a huge tree near him. “That’s all? Well, can we go back now?” However, the God told him, “You said you want to become divine, right? Take this axe, and chop that osmanthus tree down.” Wu Gang was excited because chopping a tree down was easy and quick! He could finally become immortal. However,to his surprise, the tree healed itself every time Wu Gang made a cut on it! It was impossible to chop the huge tree down. The God told Wu Gang that this tree can only be chopped down if he made 300 continuous cuts with patience and concentration, or it will keep healing itself. Moreover, he can only become divine and fly home by himself once the tree is down. Since then, the tale of a man chopping the tree non-stop in the moon spread in Chinese culture: a punishment for a man, in order to teach him the importance of perseverance and hard work. Jade Rabbit (玉兔) is well known to be the best friend of Chang E, since they live together on the moon. So, why is Jade Rabbit on the moon too? Once upon a time, three Gods disguised themselves as hungry and poor old men. They asked a fox, a monkey, and a rabbit for food. The fox and the monkey collected some fruits and food for the old men; while the rabbit only gathered grass. When the rabbit saw her poor offering compared to the fox and monkey, it cried out for forgiveness and said “you can eat me!” and threw himself into the fire without hesitation. The rabbit’s selfless sacrifice touched the Gods. They decided to make him a “Jade Rabbit” and send him to the moon as an immortal God. Jade Rabbit became the companion of Chang E and is known for making the herb of immortality on the moon. The evil apprentice Peng Meng never achieved immortality because he didn’t deserve it, while selfless characters like Chang E or Jade Rabbit were both able to achieve it. In addition to Hou Yi’s love story, there’s another version of the story about how Hou Yi went astray after he won the people’s heart as a hero and a king. He became cruel, greedy and wanted to live forever, so he asked the Heavenly Queen Mother for the elixir of immortality. However, the Heavenly Queen Mother knew his intentions, so she gave him only one piece of medicine. Cheng E knew about the medicine and thought it was wrong for her greedy husband to become immortal and continue to hurt others. So, she took the medicine herself. Hou Yi felt depressed and regretted it deeply after his wife left him forever. In Wu Gang’s story, we learned that we shouldn’t think to achieve our goals without working hard. No pain, no gain. The most important virtues are perseverance, patience, and determination. Wu Gang was stubborn, always tried to get things fast and daydreamed about becoming a God without paying any effort. The God had him chop the tree nonstop just to make him realize that only when he’s concentrated and persistent he can achieve what he wants. The Jade Rabbit sacrificed himself to help those in need selflessly, which brought itself immortality in the end. The story can also imply that it’s more blessed to “give” than to receive. However, only those who are mindless, selfless and kind-hearted to help others deserves those rewards. With these stories, we teach our children to be kind and give others what we’re capable of. How Do Chinese Celebrate Mid-Autumn Festival? Hou Yi, Cheng E, Jade Rabbit and Wu Gang play important roles in Chinese Mid-Autumn Festival and Chinese culture. As one of the three biggest Chinese national holiday, people celebrate this day with several activities. As mentioned before, the main core of Mid-Autumn Festival is the family reunion, when family members return home and celebrate together. On Mid-Autumn Festival, most Chinese people enjoy the full moon, eat mooncake and pomelo, pray for ancestors, set off fireworks, and, nowadays, hold barbeques. First and foremost, it’s full moon appreciation! Normally on the day of Lunar August 15th, the moon will be full and bright. Chinese people would gather under the moonlight, appreciate the full moon while chatting and eating. Also, people would set out spectacular firework show to celebrate. Within the family, Chinese would also play sparklers. Eating Moon Cake, Pomelo, and Barbeque! Chinese people send presents to their relatives or friends for Mid-Autumn Festival. A package of mooncakes is the best gift for this day. Mooncakes can be bought and reserved from convenient stores, cake stores, or even online. Due to the fact that the Chinese pronunciation for pomelo “柚子” (Yòuzi) is similar to “blessing the children” “佑子” (Yòuzi), and to the fact that this is pomelo’s season, this fruit became the icon of Mid-Autumn Festival. What’s more, it’s popular to wear the pomelo skin as hats just for fun! You can have whatever short hairstyle as you want, bowl cut, bob cut, or even medium-length hair. In Taiwan, barbecue is one of the most popular activities during Mid-Autumn Festival. This happened after a barbecue sauce commercial had a catchy slogan. For such an important festival, Chinese people tend to pray to ancestors with mooncake gift box and pomelo, offering them prayers and blessings. If you have the chance to experience Mid-Autumn Festival in China, watch carefully to see if there’s silhouette of Chang E, Jade Rabbit, or Wu Gang on the moon! And don’t forget to act like a local, try some mooncakes and pomelo, and design your own hat from a pomelo under the beautiful full moon!